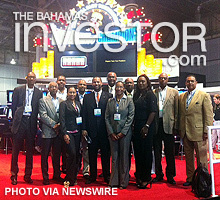 Members of the Gaming Board for the Commonwealth of The Bahamas and The Bahamas Hotel Association Casino Committee conducted a fact-finding mission at the Global Gaming Expo 2012 in Las Vegas. 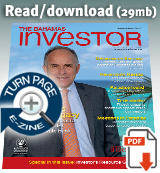 The joint public- and private-sector effort seeks to modernize The Bahamas' gaming regulations. 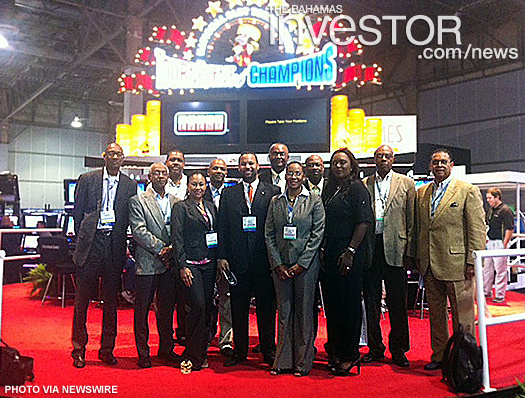 LAS VEGAS, Oct. 4, 2012 /PRNewswire/ — Members of the Gaming Board for the Commonwealth of The Bahamas (GBB) and The Bahamas Hotel Association Casino Committee on a fact-finding mission at the Global Gaming Expo 2012 (G2E), the industry’s largest conference and trade show. The delegation took part in the event’s sessions and workshops as part of a joint public- and private-sector effort to modernize The Bahamas’ gaming regulations. The Bahamas government is spearheading the effort in order to keep The Bahamas at the forefront of the world’s destination casino markets. Pictured: (from left to right) Uri Clinton, BHA; Dennis Martin, GGB; Ian Tynes, GGB; Kayla Ward, OPM; Miles Laroda, GGB; Andre Rollins, Chairman GGB; Rupert Smith,GGB;Christel Sands-Feaste, Higgs & Johnson ; Verdent Scott, GGB; Terah Rahming, GGB; Kendall Darling, GGB; Robert Sands, BHA. The Bahamas Investment and Securities Business Association held its inaugural Continuing Professional Education Seminar in Nassau October 1.